We can help you understand how and why our climate is changing, how climate change affects us, and what people can do to slow climate change and prepare for it. We explain the science behind climate change, the impacts of climate change, and how you can help. Scientific evidence paints a clear picture: Climate change is happening, it is caused in large part by human activity, and it will have many serious and potentially damaging effects in the decades ahead. Greenhouse gas emissions from cars, power plants and other man-made sources—rather than natural variations in climate—are the primary cause. These emissions include carbon dioxide — the main greenhouse gas — which has reached a concentration level in our atmosphere that the Earth hasn’t seen for more than 400,000 years. These greenhouse gases act like a blanket, trapping the sun’s warmth near the earth’s surface, and affecting the planet’s climate system. 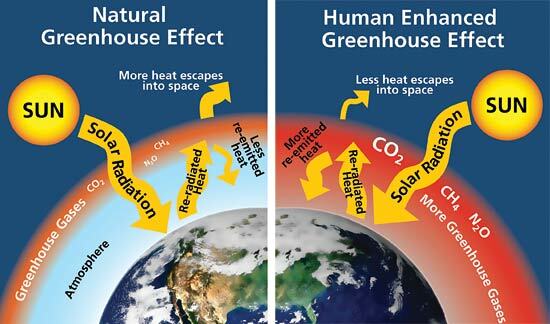 The picture below shows the greenhouse effect. Light from the sun passes through the atmosphere and is absorbed by the Earth’s surface, warming it. Greenhouse gases, like carbon dioxide, act like a blanket, trapping heat near the surface and raising the temperature. It is a natural process that warms the planet. But human activities are increasing the amount of greenhouse gases and trapping more heat. Greenhouse gases stay in the atmosphere for a long time. Although plants and the ocean absorb carbon dioxide, they can’t keep up with all the extra carbon dioxide that people have been releasing. So the amount of carbon dioxide in the atmosphere has been increasing over time. Up until about 150 years ago, human activity did not produce many greenhouse gases. That changed as forests were cleared to make way for cities and farms, and as important inventions and industrial innovations, like the widespread use of electricity and cars, transformed the way we live. These inventions and innovations demand energy. Burning fossil fuels — coal, oil, and natural gas — has become an important source of that energy. Burning fossil fuels releases carbon dioxide and other greenhouse gases into the atmosphere. Today in the United States, electricity and transportation (cars, trucks and planes) are responsible for almost 60 percent of carbon dioxide emissions. The rest comes from agriculture, industry, such as factories that make products we use, and from energy we use in our homes and businesses. Carbon Dioxide (CO2): Carbon dioxide enters the atmosphere through the burning of fossil fuels (oil, natural gas, and coal), solid waste, trees and wood products, and as a result of other chemical reactions such as making cement. Carbon dioxide is removed from the atmosphere and stored when it is absorbed by plants as part of the biological carbon cycle. It makes up 82 percent of U.S. greenhouse emissions. Methane (CH4): Methane is emitted during the production and transport of coal, natural gas, and oil. Methane emissions also come from livestock and other agricultural practices and by the decay of organic waste in landfills. It makes up 10 percent of U.S. greenhouse emissions. Nitrous Oxide (N2O): Nitrous oxide is emitted during agricultural and industrial activities, as well as during combustion of fossil fuels and solid waste. It makes up 5 percent of U.S. greenhouse emissions. Each of the past four decades has been warmer than the previous one. According to the National Oceanic and Atmospheric Administration, 2016 was the warmest year on record, and the five warmest years have all been since 2010. Rising global temperatures threaten human health, increase the risk of some types of extreme weather, and damage ecosystems. And as the oceans warm and polar ice caps melt, sea levels are rising, endangering coastal areas. These impacts are already being felt today, and groups like the poor, elderly, and those living in conflict areas are especially vulnerable. Heat waves. Heat waves are long periods of time with above-normal temperatures. As the Earth warms, more areas will be at risk for hotter and more frequent extreme heat waves. Learn more about the link between climate change and extreme heat. Heavy Precipitation. Heavy downpours are becoming more common in many locations. Learn more about the link between climate change and heavy precipitation. Sea-Level Rise. Sea level has risen about 8 inches due to the melting of glaciers and ice sheets. The warming of seas and oceans is also making coastal storms more damaging. Scientists predict sea levels in the United States could rise 1 to 4 feet in the 21st century, and could be even higher if glaciers in Greenland or Antarctica melt especially quickly. Threats to habitats and animals. As temperatures warm, many plants and animals are migrating to higher elevations or away from the equator. Some animals may have difficulty moving or adapting to new habitats. Ocean acidification. Extra carbon dioxide in the atmosphere is absorbed by the oceans, making them more acidic. This can make it difficult for corals and microorganisms that form shells to survive, disrupting the food supply for other sea animals. Wildfires. These are large fires that burn vast amounts of forests and brush. When they are not controlled, wildfires can destroy homes and be deadly. The number of large wildfires and the length of the wildfire season have been increasing in recent decades. Find out how climate change will worsen wildfire conditions. Drought. Global warming will increase the risk of drought in some regions. Also, warmer temperatures can increase water demand and evaporation, stressing water supplies. Learn about the links between climate change and drought. Weather refers to the state of the atmosphere over several minutes up to several days. It includes lots of things we are familiar with – temperature, humidity, rain, snow, wind speeds, and wind direction. Climate refers to the long-term average (and other statistics) of weather measured over long periods of time (at least several decades). Here’s a simple way to think about it: Climate is what you expect, but weather is what you get. Say you were going to visit Southern California for a few days in April. You would expect it to be sunny and pleasant, because that’s what the climate of Southern California is usually like in April. It might turn out to be sunny during your trip, or it could rain, or be cloudy, chilly or hot. All of those are examples of possible weather during those few days. The first is to reduce the greenhouse gas emissions responsible for climate change. By choosing cleaner ways to power our homes, offices, and cars, and being more efficient and less wasteful, we can produce fewer greenhouse gas emissions. Everyone can play a part in a clean energy future, including government, businesses, and you. There are lot of things you can do to help, like turning off the lights when you leave a room to reduce the electricity you use, taking shorter showers to reduce the water you use (and the energy it takes to process, move, and heat it), planting a tree to absorb carbon dioxide, or recycling to reduce waste. For example, recycling aluminum is 90-95 percent more energy efficient than producing aluminum from raw materials. Look for more ideas on what we can do together and individually. The second is to prepare for life in a changing climate. We need to make sure our buildings, roads, businesses and all the services they use can withstand the climate changes that we can’t avoid. Learn how communities and companies are preparing.